The precipitous fall of the Tweed Ring climaxed in the municipal election of November 7, 1871, which left Mayor Oakey Hall, whose term ran until January 1, 1873, as effectively its lone survivor. (Tweed was reelected to the state senate, but arrested in December and barred from taking his seat.) Evidently, the cartoonist was unable to forgive Greeley for not having been sufficiently scathing in his treatment of Republicans who cooperated with the Democratic Tweed Ring. In the December 9, 1871 issue of Harper’s Weekly, Nast again presented Greeley as Diogenes [link to 6/24/71], the ancient Greek philosopher who legendarily searched for an honest man. 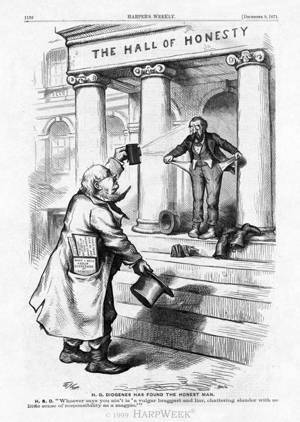 In the cartoon, the editor shines his lantern on Mayor Hall, who stands under the portico of the City “Hall of Honesty” and turns his pockets inside out to demonstrate his reduced financial condition and political purity.